Monday, the 27th looks like the best day to me. It should be flyable most of the day with an "exciting" spike from 2pm to 4pm. It's been an awesome day ... and we're still flying. I must confess ... Sam is right. We hogged it all day long!!!! I think I'll ask Robin Hastings to print a Beaches and Harbors Waiver for me and I'll fill one out and send it in with my email address so that they can cheaply return my receipt. Should I enclose a letter describing my lengthy flying history? Hi Bill, welcome to Dockweiler flying someday. Yes, the e-mail return will work. If I remember correctly, I signed my printed copy, in all the places, and then scanned it and e-mailed that image to them. However, I might have snail mailed it. We asked the Beaches & Harbors guys how they would decide on approvals and they said they will approve every application that they receive. So your HG history is not necessary. This is something that Bob, Joe, & I have discussed: how to we keep somebody who is inexperienced from causing an easily avoidable accident there. We haven't come up with an answer but so far it hasn't been a problem. If someone wants to borrow one of our gliders then of course we can control that. 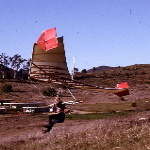 But, if someone shows up with there own glider and appears to be a danger to themselves or others then we only have the power of persuasion not authority. Of course if someone is truly a problem, the county lifeguards are the law enforcement there.